You certainly do not need Birth Story to fill you in on the birth on Monday of Prince George Alexander Louis, heir to the British throne. 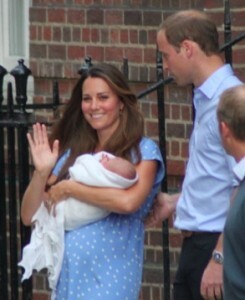 The 8 pound 6 ounce Prince of Cambridge was born on July 22, 2013. For our purposes, it's interesting that his dad was present at the birth. It is not ground-breaking, though, as Prince Charles was the first to break with tradition and attend William's birth in 1982. Charles' dad, Prince Philip, played squash in another part of Buckingham Palace during Charles' birth, but men did not typically attend their children's birth at the time. When William married Kate Middleton three years ago, I wrote extensively about past British royal births of the 20th century, which you can see in my archives from late April of 2011. The births of British royalty have historically twined together with the latest birthing practices, and so, for the purposes of Birth Story, they are important.